Our hearts are very saddened and the room a bit less bright with the loss our sweet, little girl Everee. She was ab;e t overcome great abuse and neglect, but in the end was unable to beat her battle with a chest tumor. We will never forget you little, brave one with beautiful eyes and soft spirit. This incredibly sweet and brave little is a real survivor! She came to SaveABunny in June 2012 from the San Jose euthanasia list. She was in very poor condition with a large growth in her ear, massive fur loss from mites and painful, raw and infected feet from sitting in her own urine in a rusty wire cage. It's amazing that she survived such TERRIBLE neglect. Even more incredible is how loving and trusting she is despite being subjected to such abuse and trauma. We named her "Everee" because she is a reminder that EVERY bunny deserves to be treated with love and compassion. She was on several antibiotics,including injectibles,as well as pain medication, but we were unable to get the infection under control. In September 2012, infection spread up her jaw bones and behind her right eye. A major abscess formed behind the eye causing her eye to swell and bulge to more than three times its normal size. Her only chance was emergency enucleation (eye removal. Additionally, while she was under anesthesia during surgery with the incredible Dr. Carolynn Harvey,it was discovered that 6 of Everee's teeth were loose and rotted and needed to be extracted. It is a miracle that Everee not only survived this surgery, but is now THRIVING! We believe miracles are possible and we experience lots of them. We seek the best in veterinary care and then add in Reiki and complementary healing. We don't give up easily and we bond deeply with the rabbit. 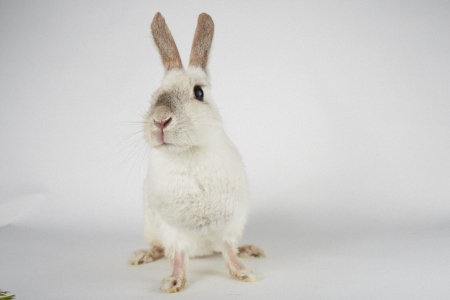 We closely monitor both the physical and emotional well-being of the rabbits in our care. This connection provides a successful healing environment where each rabbit knows he/she is safe and loved. Everee made a clear choice to fight to be alive and we honored that choice. Just as we would have honored her state if she was suffering and didn't want us to keep her alive. She is listed as a special needs rabbit and we are very picky (even more than usual, which says a lot! )about who can adopt her. She needs to have a deep bond with a person---and that person also has to be Ok with the fact that using the litter box is not a high priority for Everee. Currently, she is not on any medication and is doing great. Anyone looking to adopt her will need to be ready and able to provide potentially expensive veterinary care if needed in the future. Maybe you just want to help us celebrate her recovery and be her fairy godmother/ godfather and sponsor her? and Heather at the Rabbit Haven for providing transport, $100 donation and little treat bag for Everee's journey to SaveABunny. Working together we save so many more lives.